What the American tax payer wants is equality. Did you know if you’re innocent and investigated by the police due to a false police report you’ll still have a record. Even if not found guilty that investigation will be on your record so if someone checks your record it will appear. It will still be looked at as negative and affect your life. A Badge, Robe or title allows real criminals to hide behind an image of shame. Frauds, liars, con-artist matters not if you get a badge, robe or title you’re now above the law. Would an innocent person retire as soon as possible to keep their benefits and pension? Just because he was not caught or exposed for other crimes does not mean they did not take place during his career. Remember a badge grants certain privileges and people often don’t consider them to be criminals. 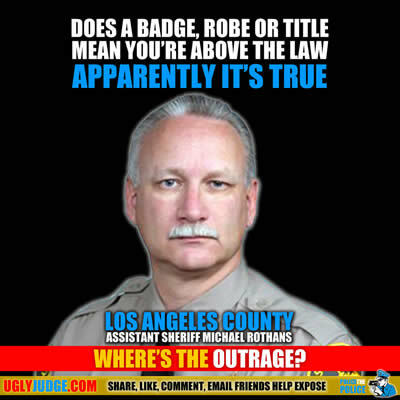 Assistant Sheriff Michael Rothans while innocent or not must be held to the same laws and standards every American is forced to obey and abide by. Police should NOT be able to buy cars they have impounded, it’s a total conflict of interest. Judges all over America have had their hands in dishonesty and rarely are they held accountable. Los Angeles Country Judge Aviva K. Bobb had close ties to a property company whom which the judge worked closely with to liquidate homes belonging to seniors. That same company was a sponsor to many events held by the judge. These common conflicts of interest are dishonest, criminal and rarely investigated by government. Los Angeles County Assistant Sheriff Michael Rothans bought a stolen luxury sedan last year from the owner of a towing company that contracts with his agency. Assistant Sheriff Michael Rothans paid $3,000 for the 2012 Audi A4, which had been seized by his own department Los Angeles County Sheriff from a suspected gang member at a drunk-driving checkpoint. (Suspected no proven). The Sheriff’s Department launched an internal investigation last week after The Times questioned Assistant Sheriff Michael Rothans about his vehicle purchase. Oh, and Michael Rothans bought the Audi for $3000, which appears, at least on the surface, to be a preposterous underpayment. (Keep in mind that this make and model, if it is in good condition, would sell today in the $20,000 range. If in bad condition, but drivable, it goes for $10,000 or so.) Admittedly, Michael Rothans claims he had to make a lot of costly repairs but, when we last checked, he was still unable to produce receipts for those repairs. The fact that Michael Rothans made the purchase only came to light after the phoney VIN number on the car—presumably affixed by the thieves after they stole the Audi from a dealership—got flagged by the DMV. The DMV then sent a letter to the assistant sheriff asking him to bring the Audi in for a “VIN verification.”….and things got mighty messy from there—especially after the LA Times’ Cindy Chang got wind of the stolen car and contacted the LASD to ask a few questions. News travelled quickly to Sheriff McDonnell who asked Internal Affairs to launch an investigation. McDonnell also asked that LASD Inspector General Max Huntsman be notified of the probe, and said he welcomed Huntsman’s involvement. We are happy to note that, according to the LASD spokesman, Commander Keith Swensson, “a full and complete investigation” into the matter of Assistant Sheriff Michael Rothans and the stolen Audi will not be derailed by his retirement, but is ongoing.